So you want to be a superhero. Well, you have a lot of options to choose from. There's vigilantes, super-powered people, mutants, anti-heroes, regular joes with some killer smarts and technology, aliens, magic beings... the list goes on and on really. But, perhaps you have a particular one in mind? One that stands out in your mind due to either their skills, character, or excellent backstory? We've one that pops into head immediately, especially if we're operating in the DC realm. Here's a hint: She's super strong. Trained in combat. Has some crazy bullet reflection skills. Looks a bit patriotic. That's right, we're talking about the Princess of Amazons herself: Wonder Woman. Smart, caring, lethal, she has all the best superhero features. Plus she has some pretty cool toys. A lasso that makes people tell the truth? Impervious bracers? An invisible jet? This woman is equipped. So if you're feeling like the embodiment of strength and wisdom, maybe you need to try out our Wonder Woman Teen Costume. It's a red tube dress with blue miniskirt. There's stars, the Wonder Woman logo, and a red cape. 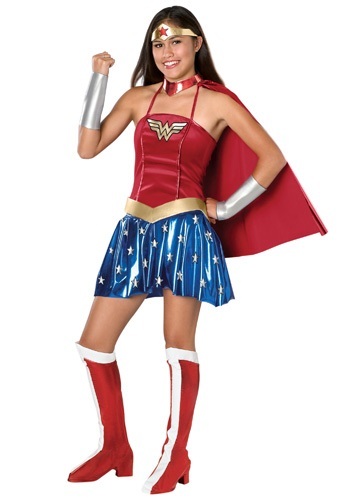 Add the boot covers, tiara, and silver wristbands and you'll be equipped like our favorite Amazonian. Only make sue you remember where you parked the jet. That thing is notoriously hard to find.